Bring a classic feel to your home or business with the Whitehall Providence Arch Wall Plaque. 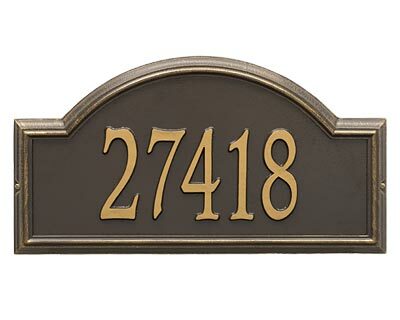 This durable recycled aluminum plaque will surely last a lifetime and the numbers can never fall off as they are cast with each order. The single line can be personalized to hold up to five 5.5" characters. This attractive, hand cast plaque will clearly display your personalized line, year after year. This address plaque may be wall mounted. Hand cast from recycled aluminum in the USA. Simply use the color chart and space below to choose your style and enter your personalized line.